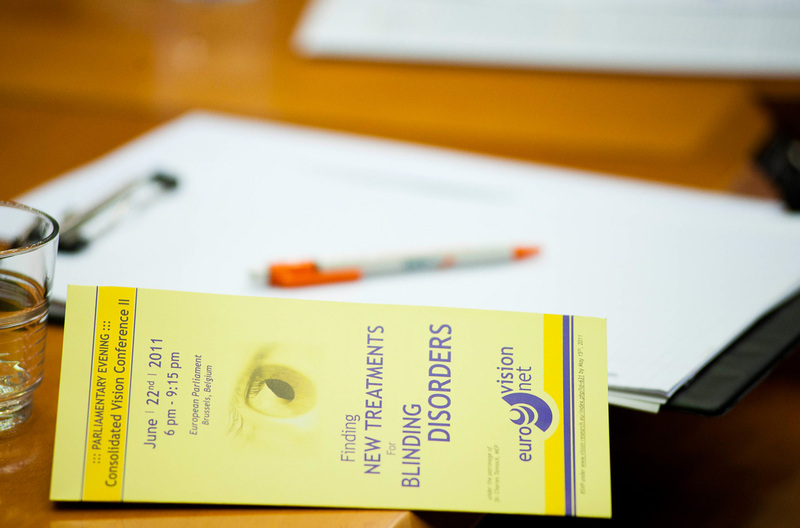 "Finding New Treatments for Blinding Disorders"
Dr Charles Tannock, a Member of European Parliament for the London Constituency, sponsored a parliamentary evening at the European Parliament in Brussels on 22nd June 2011. The title of the meeting was “Finding New Treatments for Blinding Disorders”. This meeting was supported by a grant from the European Union, called EuroVisionNet. 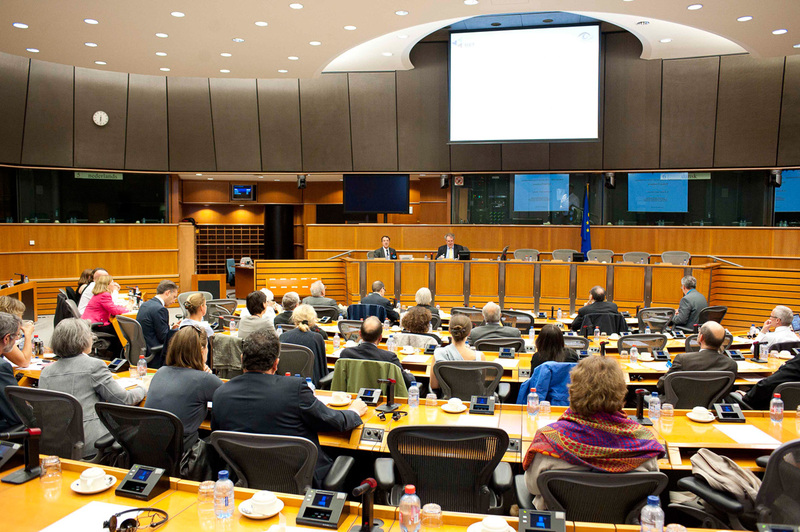 There were five speakers and an audience of sixty individuals, including Members of European Parliament and individuals from the European Commission. The meeting opened with a welcoming address from Dr Charles Tannock. Dr Tannock explained to the audience that he had trained at the Middlesex medical school in London as a doctor. The Middlesex medical school is now part of University College London. 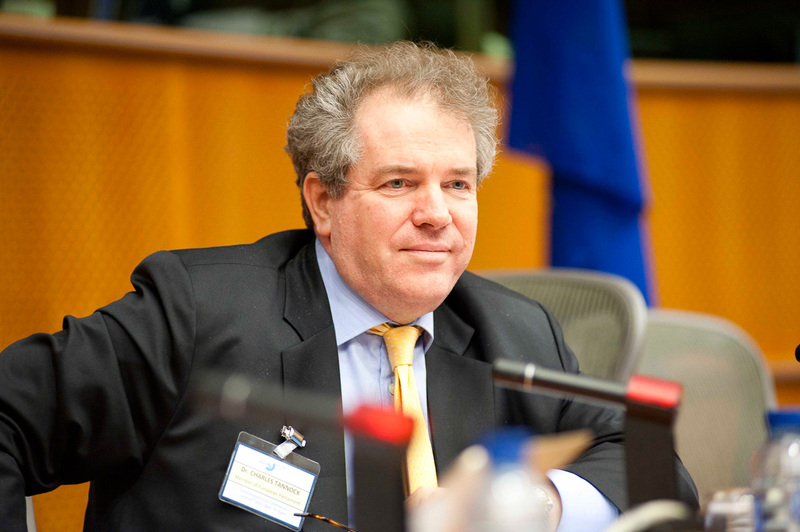 He had trained in Psychiatry and held a consultant position at University College Hospital London until he was elected to the European Parliament. 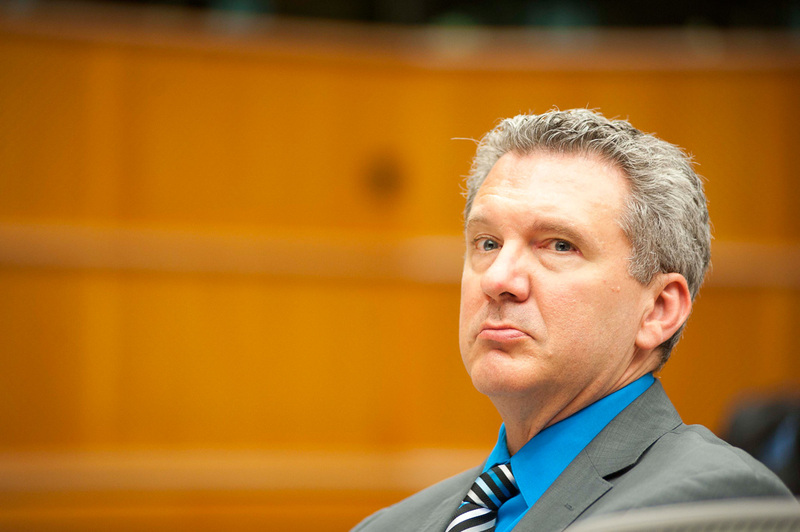 He welcomed the participants to the European Parliament and emphasised how pleased he was to sponsor the meeting. The opening talk was by Professor Eberhart Zrenner who set the scene by emphasising what an important problem visual impairment was in Europe. 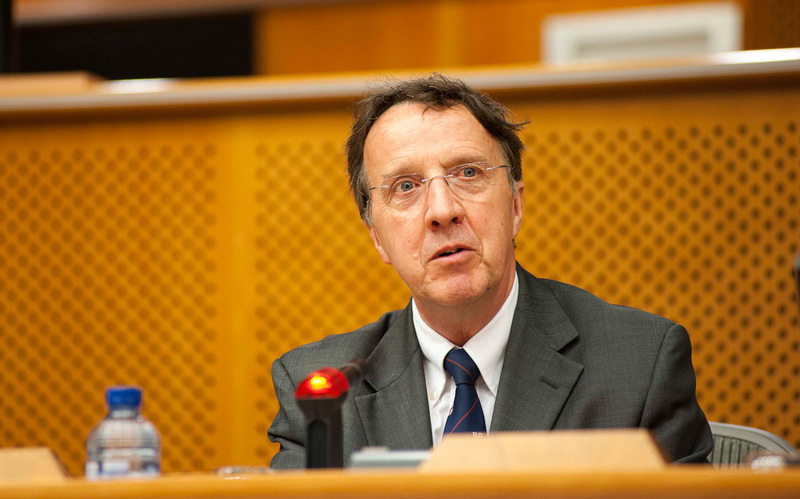 He gave a brief introduction to the major causes of blindness in Europe including an estimate of the numbers of blind and partially sighted individuals living within Europe. 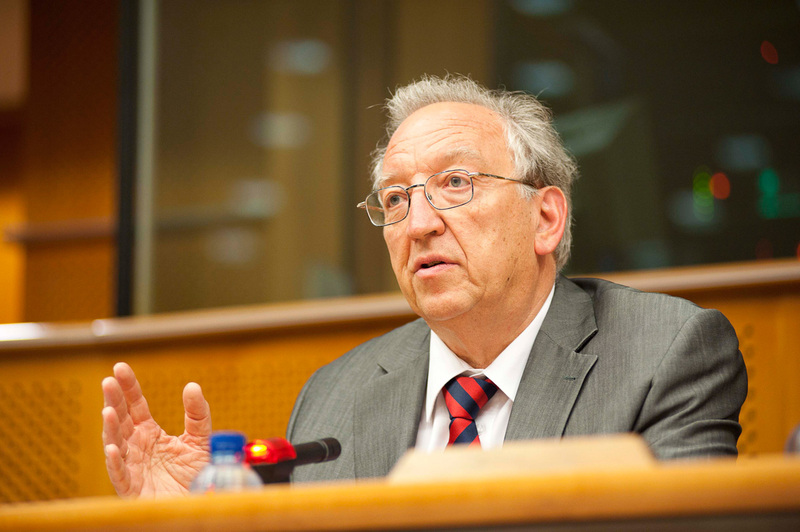 He continued by emphasising the importance of translational research to develop new treatments. He finished his talk by showing an example of how multi-disciplinary collaborations can develop new treatments. He described the advances that have been made in developing the retinal implant which allows patients who have lost the light sensitive cells (photoreceptors) in the retina to see again by stimulating the nerve fibres in the retina. 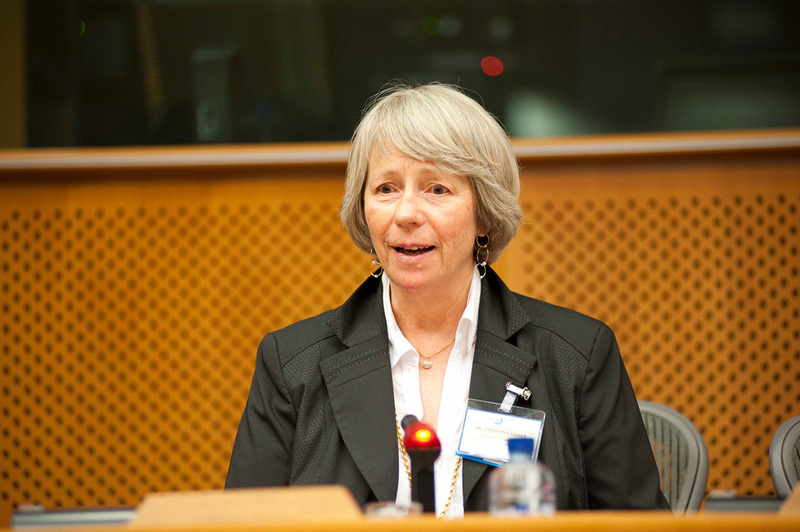 Christina Fasser, the president of Retina International, an organisation of patient support groups and research charities, spoke about translational research from the patients’ perspective. She emphasised the fact that patients are extremely keen to develop new treatments and are keen for international collaboration in the research effort to develop these treatments. 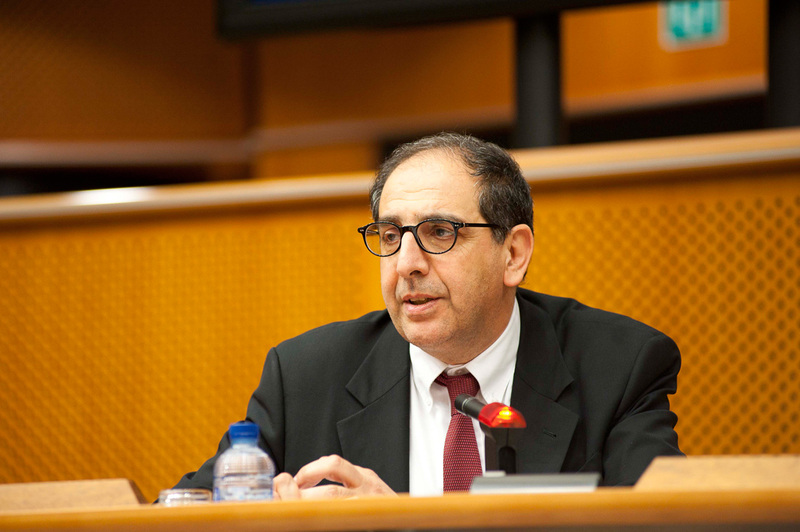 The third speaker was Professor José Cunha-Vaz from Coimbra in Portugal who highlighted the need for collaboration across Europe for clinical trials. He gave an account of the clinical research network which is set up across Europe to develop the infrastructure for European-wide clinical trials. James Jorkasky spoke next. James is the Executive Director of the National Alliance for Eye and Vision Research. This is an organisation which lobbies in the United States to increase funding for vision research. James gave a very informative and entertaining account of his role in supporting vision research in the United States and gave useful insights into how to lobby politicians to increase awareness of the need for vision research. He was careful to point out that there were significant cultural and other differences between Europe and North America, but there is much to be learnt from his experience in the United States. 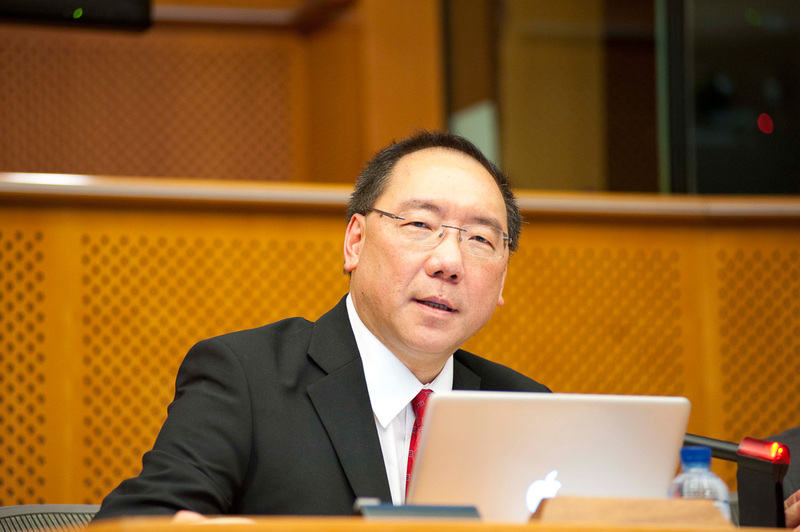 The final talk was by Professor Peng Tee Khaw, professor of Ophthalmology at the Institute of Ophthalmology and Moorfields Eye Hospital, London. Professor Khaw is Director of the National Institute of Health Research, Biomedical Research Centre in London. Like the other speakers, Peng emphasised the great importance of translational research and gave some important examples about how advances in basic science are now being translated into clinical practice. 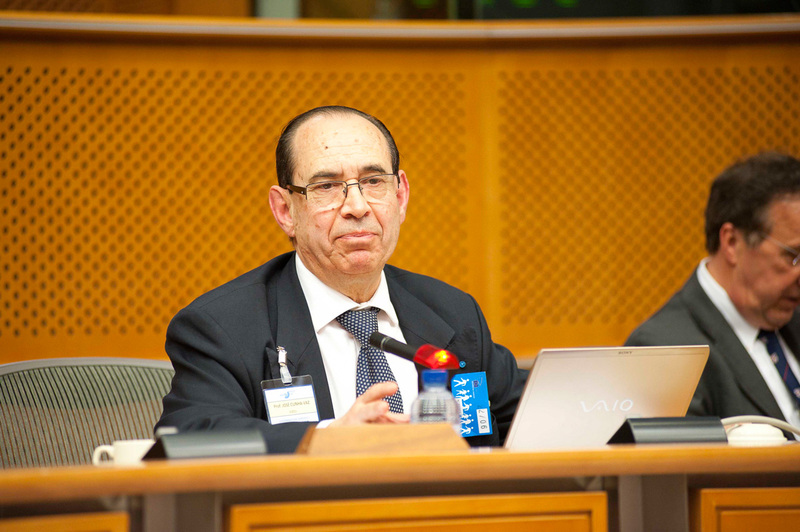 Finally, Professor José Sahel, Professor of Ophthalmology at the Quinze-Vingts Hospital in Paris and Director of the Institute of Vision in Paris gave a brief summing up of the key points he had taken away from the meeting. At the end of the meeting there was a wine reception where the speakers could meet with the participants for further discussions. The meeting was judged a success and worth repeating, although we need to give further thought to the timing of the meeting so that more MEP and Commission staff are able to attend. "Current and future treatments for retinal disease"
The research partners in EuroVisionNet organised a symposium at the Euretina meeting 2011 in London. The symposium was chaired by Professor Moore from the Institute of Ophthalmology in London and Prof. Cunha-Vaz from the University of Coimbra in Portugal. 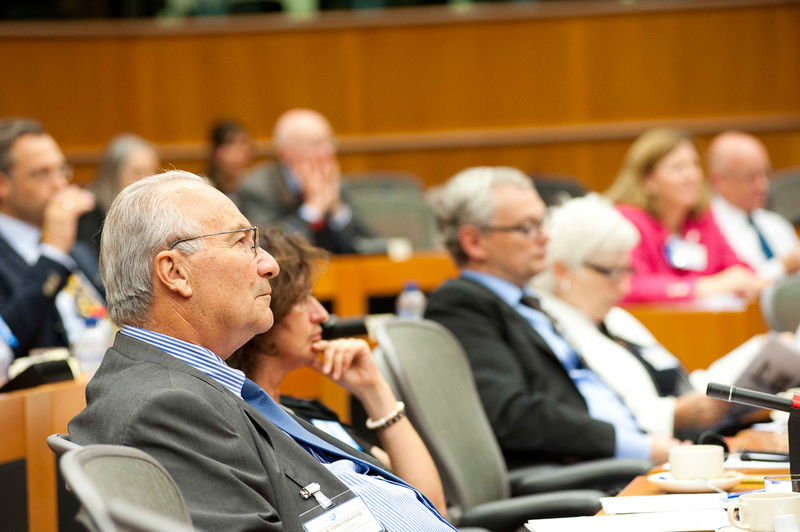 The aim of the meeting was to discuss current and future treatments for retinal disease. Euretina was chosen as the forum for the symposium because of the high number of retinal specialists (over 3,000) that attended the meeting. The symposium was one of the main symposiums of the meeting and we were pleased to find there was a very large audience. The meeting was started by a talk from Dave Shima who spoke about the basic science behind the development of novel anti-VEGF agents which have proved successful in the treatment of age-related macular degeneration. He also discussed areas where treatment could be improved and what new therapies may be on the horizon. Thomas Gardner from Penn State College of Medicine, USA, gave an excellent talk on the pathogenesis, current treatment and treatments that may be in the pipeline for diabetic macular oedema which is a major cause of vision loss in diabetes. Frank Holtz, Professor of Ophthalmology at the University of Bonn discussed the management of the “dry” form of age-related macular degeneration – geographic atrophy. Professor Holtz emphasised the importance of careful imaging of the retina and the importance of careful natural history studies in advance of clinical trials. He also discussed the need for robust end points in clinical trials of novel therapies. Finally, he discussed current and future treatments for this common disorder. Prof. José Sahel opened his talk by discussing the options for treatment of inherited retinal disease and then focussed on the best approaches to preserve or rescue photoreceptors in early and mid stage disease. He explained that in some inherited retinal diseases where the mutant gene is only expressed in rod photo receptors, the cones later die. He described his own work in trying to identify the mechanism of cone cell death and described the identification of a gene encoding a protein which is called rod-derived cone viability factor. He and his group have been working to try to develop treatments that will preserve cone function in the face of continuing rod photo receptor cell death. Professor Robert Maclaren from Oxford University discussed the current state of stem cell therapy for retinal disease. He discussed the major advances that have been made in the laboratory and in developing retinal pigment epithelial cells and photo receptor cells from stem cells and also the progress that has been made in encouraging integration of photoreceptors into degenerating retina. He was careful to point out that there was still a significant amount of basic science work that needs to be done. But he was optimistic that stem cell therapy would eventually be an effective treatment for retinal disease. The meeting closed with a talk by Eberhart Zrenner on the development of retinal prosthesis that can be used in advanced stages of inherited retinal disease when there has been near complete loss of the photo receptors. The retinal prosthesis work by stimulating ganglion cells in the retina directly. He described the two basic approaches that have been used: the epiretinal implant and the subretinal implant and discussed the advantages and disadvantages of each type of prosthesis. He then discussed the progress that has been made by his multi-disciplinary group in the University of Tübingen in developing the subretinal implant and described the early results of his clinical trial. The symposium was very well attended and overall gave a very good overview of current and future treatments for retinal disease.